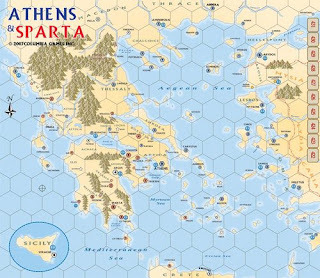 The game reflects the second Peloponnesian War between Athens (democratic sea empire) and Sparta (militarized land empire) - from my point of view a pretty interesting setting. The whole game is based on Columbia's well-known block game system, which is also used for the popular game "Hammer of the Scots". The board is quite big and looks pretty - even though it's not mounted, and printed on rather thin cardboard. The blocks are solid quality (red for Sparta, blue for Athens and green for the neutrals), you just have to put the stickers of the different units on them, which doesn't take a lot of time. Overall you play through seven Olympiads, each one consisting of seven turns for each player. Depending on the respective card played, different numbers of blocks can be activated (Move, Combat) and eventually also events are triggered. Combat is resolved pretty logical by using the information printed on the blocks (order is given by the aplhabetical character, chance to hit is defined by the number). As the stickers are just put on one side of the blocks, some kind of "Fog-of-War" is created, making the strategy of the opponent not really predictable. After each Olympiad the actual victory points (= Build Points) are calculated for each player, whereas each controlled city has a certain value. 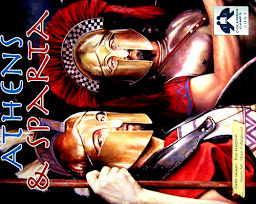 Athens & Sparta is basically a fine and enjoyable game, although the first sessions seemed a little static and sometimes unbalanced to me. But taking into consideration that in this game defensive play is usually more rewarded than aggressive operations, and assuming furthermore that you like the setting, you should give it a try - maybe for the first time at your friend's place, to decide later on if you want to own it for yourself or not.